Willing money to your grandchildren is a great way to make sure they're taken care of when you no longer need it. While it's always a great idea to consult with a financial advisor, you should know how long an inheritance lasts, how money can be divided, and what the tax consequences are. For example, some financial experts say that most people spend money that they've inherited within one year. Considering that you want to give money to your grandchildren, who are presumably younger and less financially astute than the average inheritor, the chances of your money being used wisely are slim. Luckily, talking to your grandchildren before you leave them money can improve the chances of them using it right. Generally, the older your grandchildren are, the more likely they are to use their inheritance over time. Young adult grandchildren may be better recipients than babies, as leaving money to underage children must be under the care of a custodian. Choosing the right individual for that job can be a tough decision as well because although parents are obvious choices, there are parents who are unable to take on their children's inheritance. Unless your children are very financially secure, you should consider willing money to them as well. Skipping your children to give money to your grandchildren can have implications of mistrust. Leaving money to grandchildren isn't as simple as it sounds, because you have to decide on a number of issues. First, you have to consider whether you want to divide each child's portion among his or her children or give each grandchild an equal amount. In the latter case, a child with a large number of children will have an advantage, and a childless child would be cut out altogether. A grandchild predeceasing you. If this happens, that child's portion will need to be allocated to another family member. Making provision for unborn grandchildren. Although this can be done, the process can be complicated. Including step-grandchildren. Be mindful that step-grandchildren are not your grandchildren in the eyes of the law unless they have been legally adopted by your child. In such cases, they must be given a separate bequest in the will if you wish to include them. Most individuals don't pay federal estate tax, because it is assessed only on substantial estates (currently upward of $5 million). Those with a substantial estate cannot avoid estate taxes by leaving their money to their grandchildren, because the government assesses a generation-skipping tax (GST). In such cases, you may want to give money to your grandchildren while you are alive, taking advantage of the provision that you can give $15,000 per year to each grandchild without paying a gift tax. No matter which direction you choose to go, if you are fortunate enough to have a large estate, you'll need expert advice to minimize taxes. Trusts have been used to minimize estate taxes for some time, but they are gaining popularity among the non-affluent, for whom estate taxes may not be a problem. Trusts have a couple of other advantages. First, financial assets that have been placed in a trust don't require probate and thus don't become a matter of public record. Also, you have more options over what happens to your money than you have without a trust. 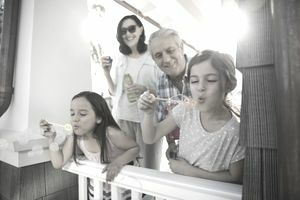 Specific types of trusts may be especially suited for grandparents wishing to benefit grandchildren and should be reviewed with a lawyer or financial adviser. For many grandchildren, it's being remembered that matters more than the inheritance itself, especially if it's paired with a sentimental object from the grandparents' estate. Consider a bequest as an opportunity to tell grandchildren that they are loved.